My newest necklace, "Desert Dream," harkens to my six year sojourn in Silver City, New Mexico. For a year I lived in the requisite adobe, actually up in the mountains in Pinos Altos, an old mining town. Silver City itself was a copper mining town, though the industry had shut down. Artists began to move in and a vital and diverse artist community developed. There were about fifty-five galleries in and/or close to Silver City. It was an artist's dream. I was affiliated with a number of galleries while I was there, showing both my mixed media art work and my jewelry. 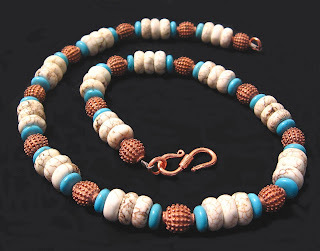 The sand colored stone in "Desert Dream" is Magnesite. The fine veins of dark brown are very much like horsehair pottery, which was becoming very popular throughout the southwest. And of course, a necklace inspired by my past in Silver City wouldn't be complete without Turquoise and Copper. The Copper beads are vintage, and I love the little bumps on them. They add texture to the design. My "artists residence" in New Mexico continues to inspire me today.